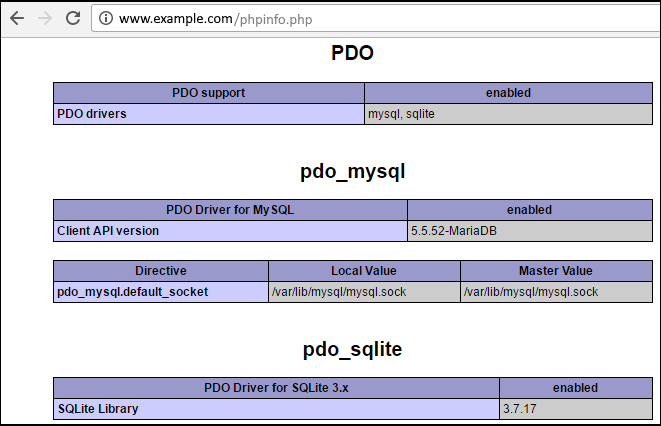 To be able to connect to MariaDB using PHP, PHP must be configured to use MySQLi or PDO. This tutorial will use PDO. Use apt-get or yum to install PDO and MYSQL for PHP. If using PHP FPM, restart PHP. Navigate to http://www.example.com/phpinfo.php and ensure PDO is listed. Set the SELinux policy to allow HTTPD to connect to MariaDB. The following PHP code is used to make a PDO connection to MariaDB. If the connection is successful, "Successfully connected to MariaDB" will be displayed.